At present time there are billion of Android phone users around the world. The Android users love to use different kinds of Apps in his phone. Lot of time we need to transfer large size data from one Android phone to another phone, but it will consume lot of time. Now, quick data transfer apps for Android phone article will helps you to immediately transfer large amount of data in a short period. Most of the time we need to transfer movies, videos, photos and other documents. At this point if you have to use Bluetooth facility then it will take lot of time and you will be frustrated. All we know, we don’t have enough time for these things. But if you face these kind of problems then there is no need to worry you will be able to easily transfer large data in short period. This article again shows an importance of Apps for our Android phone. 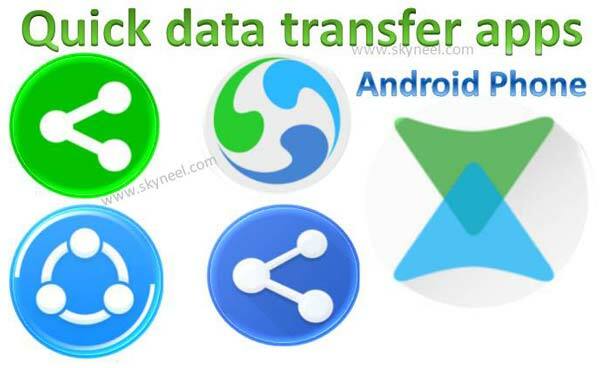 It is one of the best quick data transfer apps for Android phone. With the help of this app you will be able to easily transfer or share files quickly. The data transfer speed is 200 time faster than Bluetooth and there is no need to use Internet or USB cable. The SHAREit app support for all Android, iOS, Windows phone. At present time this app is used by 400 Million users within 200 countries. You will be able to easily download this app from Google Play Store. This app occupied only 5.38MB space on your phone memory. If you want to download this App from Google Play Store then you have to click on this given link. Xender is another best quick data transfer apps for Android phone and computers. Xender allows you to transfer files between any any device without using Internet or Wi-Fi connection. This app support group sharing up to 4 devices at a time. If you want to share any file or heavy data then you have to create the group and then you will be able to share your data. The Xender app is occupied 7.43MB space on your phone memory. If you want to install this app on your device then you need Android 2.3 or upper version. The users gives 4.3 ratings of this app as per watching the performance. You can easily download this free to use app from Google Play Store by clicking on this given link. With the help of ShareCloud you will be able to share apps, videos, images, files with other devices by 1 click. ShareCloud allows you to share files with the helps of Bluetooth, HotSpot, Email, WhatsApp, Google Drive, Dropbox, Facebook etc. This app is already used above 10 million peoples in his Android phone. You will be able to easily download and install this free to use app from Google Play store. The ShareCloud app occupied only 3.71MB space on your phone. If you want to download this app then you have to click on this given link. CShare is another best quick data transfer apps for Android phone and other devices. With the help of CShare you will be able to easily transfers or share videos, apps, music, images between phone or any other device. The sharing speed 10 time faster than 3G and 30 times faster than Bluetooth. There is no need to pay any network charges or Wi-Fi connection. This app is already installed by 50 million peoples. The user gives the 4.4 ratings of this app as per watching his performance. If you want to download this app you must need Android 2.3 or upper version. This app is occupied 2.79 MB space on your phone. Share apps is another best quick data transfer apps for Android phone. With the help of Share apps you will be able to quick sharing one or multiple apps, movies, files, images, moves to SD card,. You can take backup of your all apps directly from SD card, open or uninstall any app quickly. The 1 million users already download this apps and the user rating is 4.3. If you want to download this free to use app then you must need Android 2.3 or upper version. The Share apps occupied 2.3MB space on your phone memory and if you want to download this app from Google Play Store then you must click on this link. I hope all these best quick data transfer apps for Android phone are useful for all those users, who face the problem during data transfer. If you have any suggestions regarding this article then write us in the comment box. Thanks to all.